This is delicious! I took a couple rips and instantly loaded it up in my squonker (reserved only for recipes I plan on vaping a lot). I'm a huge fan of that deep, buttery richness. So well balanced. The caramel gives of that almost burnt sugar note that really catapults this recipe into awesomeness. Great job shyndo! One of my favourite mixers at the moment and a really sound guy. Excellent recipe. 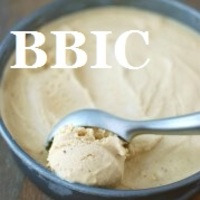 Thick, nuanced brown butter ice cream. Shyndo nailed this one. I thoroughly enjoyed this fresh, but over the course of two weeks it has solidified into an absolute treat. The sweet, almost tangy caramel is backed up by a rich vanilla ice cream. The FLV Cream really emulsifies everything together through the steep. Such a good call. It isn't overbearingly sweet; I can vape it all day long. This is a definite keeper. I'll be mixing a major stash. Thanks for sharing, Shyndo. Very well done, my friend. Only 2 days into curing and I really enjoy this. Good job man.